According to a recent announcement from the Chandra X-ray Observatory, the so-called "supernova remnant" Cassiopeia A (or "Cas A") harbors a strange passenger within the neutron star that is supposed to inhabit its interior, a form of superconductor known as a superfluid. As theory suggests, neutron stars form when large stars exhaust their fuel supplies as they age. Once a star with about five times the mass of our Sun accumulates enough thermonuclear "ash" composed of non-fusible elements like iron in its core, it undergoes a catastrophic implosion. Since nuclear reactions can no longer be sustained, the star becomes the victim of its own gravity field. The star's outer surface collapses inward at tremendous speed, rebounding off the dense core material. The star then erupts outward in a supernova explosion, blasting its outer layers into space, releasing X-rays, gamma rays, and extreme ultraviolet. Depending on the mass of the star, the remaining stellar core material might remain as a hot, white dwarf star, or if it is large enough, the gravity field will pull all the electrons out of their atomic orbits and squeeze them into the nucleus, forming neutrons. The star will become what astrophysicists call a "neutron star" with unbelievable density and gravitational attraction. It is commonly said that a teaspoon of neutron star stuff would posses an inertial mass in the billions of tons. A neutron star is thought to exist at the center of the Cas A nebular cloud. In the image at the top of the page, various frequencies of X-rays are shown in red, green, and blue. Since X-rays are invisible, the colors are arbitrary and are either assigned by a computer program or a graphic interpreter who's job is to create images for public release. The interesting thing about the X-ray distribution is that they are englobing the central star, with tendrils of plasma interconnecting other glowing regions. In a previous Picture of the Day, the fact that supernova explosions emit X-rays was used to support the contention that supernovae are not kinetic events resulting from gravitational collapse, rebound, or shockwaves. 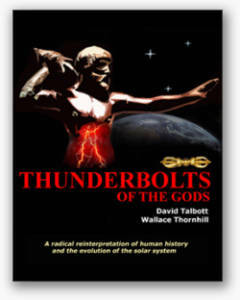 Instead, they are electrical in nature, with behavior that cannot be calculated based on simple Newtonian mechanics. Rather, plasma physics and the action of electrodynamic forces should be brought to bear in order to unlock their puzzles. It is a principle of science that one should begin with the simple and then continue to the more complex if the situation warrants that step. 2 + 2 = 4 does not require algebraic equations to solve it. 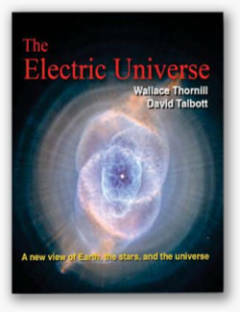 If the foundational precepts of Electric Universe theory, based on well-established, Nobel-vetted work by dedicated researchers in the physics of high-energy plasma provides concise, laboratory replicated answers to the puzzle of supernovae, then this writer submits that that is the most logical place to begin an exploration. Although Electric Universe responses to the Chandra team's announcement provide a sober minded explanation, what is it that the researchers themselves conclude? 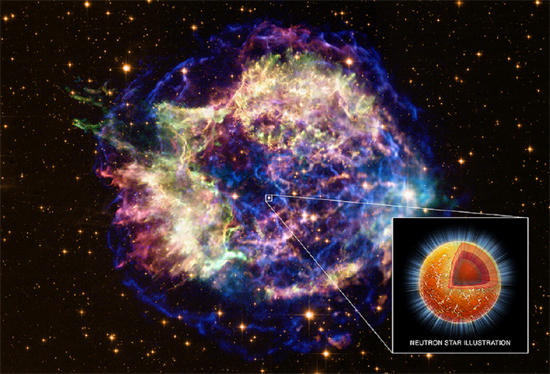 As the artist's impression at the top if the page indicates, they conclude that a neutron star, something never observed by any telescope, has a crust (orange) and a core (red). 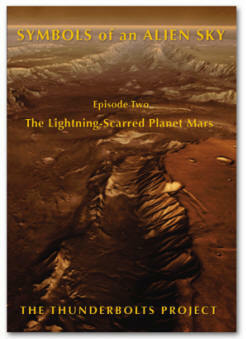 The core temperatures are estimated to be a billion degrees Celsius. The blue rays are supposed to be neutrinos escaping from the neutron star, causing it to cool off, forming a neutron superfluid. A research team leader, Peter Shternin of the Ioffe Institute in St. Petersburg, Russia said: "The rapid cooling in Cas A’s neutron star, seen with Chandra, is the first direct evidence that the cores of these neutron stars are, in fact, made of superfluid and superconducting material." The remainder of the press release contains what appears to be sheer speculation involving the predictions of mathematical models and how mathematical entities like neutron stars ought to behave. If the astronomical community was not so serious about their contentions, it would be tempting to think they were being ironic. 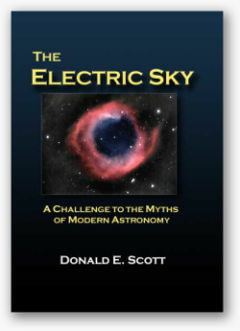 Contrasting the Electric Universe perspective with that of consensus science can be instructive. In the first sense there is simplicity, experimental evidence, mathematical illustration backed by laboratory analysis: explanations that can be communicated easily to almost any audience. In the second, arcane mathematical reifications are placed onto a stage created out of computer models: characters acting out scripted roles. Neutron stars can never be experimentally verified. The scalable nature of plasma's electrical and physical properties is critical when it comes to investigating the cosmos. In the laboratory, effects that model those in space can be created. Gravity's effects are not scalable in the laboratory. Gravitational force falls off with the square of the distance, where the attraction between electrified filaments is linear and is up to 39 orders of magnitude greater. Gravity is too weak to model. Virtual models operating within computer algorithms have replaced direct observation in many ways. Models are used to support the existence of yet more models. Models are used to build other models, which, in turn, are used to "confirm" further models. Physics used to mean investigating the nature and properties of matter and energy. Instead, astrophysics has become an apprentice to mathematics.